LISTEN NOW! Greg, John, and Pat discuss how there are a lot of good police officers. They continue to discuss about how you may have sometimes wondered how certain people got to the place or position that they are in. Just because you may have encountered a good nurse doesn’t mean that all nurses are good. Just because you may have encountered a good school teacher or professor does not mean that every educator is just as good. You may have wondered how certain people got to the place or position that they are in. They continue to further discuss the importance of differentiating people in positions for instance like police officers. Just because there have been a couple of bad police officers you have experienced doesn’t mean that all police officers are bad, In fact, they speak about how there are plenty of good police officers today. Many times police officers are just carrying out what the elected boss desires. True change comes when their elected boss is replaced. Understand it is your local police officer who is going to be there for you in difficult times especially in the times that lie ahead. If you are not for them why should they be there for you? A great majority of police officers are good. Go tell one today how much you appreciate them. 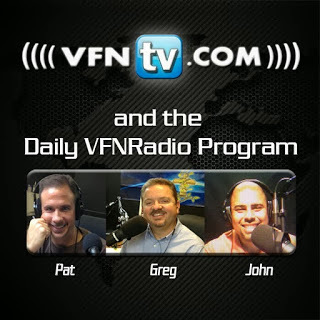 Greg, John, and Pat discuss the latest announcement to come from Amazon regarding the CEO Jeff Bezo vision for delivering packages using drones. Talk about out of the box. They continue to discuss how they were already pleased with Amazon’s two day shipping but now Amazon wants to be able to deliver your package in 30 minutes or less. According to USA Today “The idea would be to deliver packages as quickly as possible using the small, unmanned aircraft, through a service the company is calling Prime Air, the CEO said. Bezos played a demo video on 60 Minutes that showed how the aircraft, also known as octocopters, will pick up packages in small yellow buckets at Amazon’s fulfillment centers and fly through the air to deliver items to customers after they hit the buy button online at Amazon.com.” They continue to discuss some of the implications of such a delivery system. Greg, John, and Pat discuss the recent passing of Paul Crouch, founder of TBN, Trinity Broadcast Network. They continue to discuss how Paul was 79 when he passed and had been sick for some time. They further discussed that the first thing broadcast from Paul on TBN were the words “Hello Church”. They also discuss that these were the same first words spoken from VFNRadio in this digital space. They further discuss the words of wisdom he shared with his son that he was entrusting TBN with. He said that just as God was with him and his mother Jan, He will be with you. Indicating that if you continue and follow God as I have followed Him He will be with you. Success is not guaranteed. They continued to discuss the disastrous steps Rehoboam took when he inherited what was passed down to him. Greg continues to share the importance of relaxing and understanding that this is Paul’s legacy and to seek the wisdom of those who have been laboring with his dad. Often times men like to build things around people. Brother Ken Sumrall shared with his spiritual sons that upon his passing he instructed them to continue on he didn’t want anything built around him. They encourage us to continue to pray for the Crouch Family.